In this part of the series, we make a dedicated discussion on some of the best and most popular social sharing and bookmarking plugins for WordPress. These plugins will help you to harness the true power of the social networking sites by giving your visitors an easy way of sharing, emailing and bookmarking your content. These are some of the best social sharing plugins for WordPress which are enough to meet all your sharing and bookmarking needs and boost your social traffic. Flare is a very simple yet eye-catching social media plugin which offers a lot of customizable options and is perfectly compatible with almost all major social media services. This simple yet amazing plugin helps to boost your social traffic by helping your visitors to share, bookmark and email your content to over 330 services. This light-weight yet effective plugin adds some modern-looking social media buttons and icons without putting a heavy burden on your WordPress site. This plugin creates really attractive, responsive and retina-ready social followers and subscriber numbers with support for over 21 social networking sites. It is a very simple and easy to use WordPress plugin which lets you add a sleek and modern looking social widget with support for displaying statistics from several social networking services. Microblog Poster does an excellent job in automatically publishing the new content of your blog on various social networking sites like Facebook, Twitter, etc. Digg Digg by Buffer is a very powerful and versatile plugin, which seamlessly integrates with almost all social media services and also offers a lot of customizable layouts and options. ShareThis gives an extra edge in your social sharing by adding some really innovative and attractive features like Social Analytics, CopyNShare, etc. 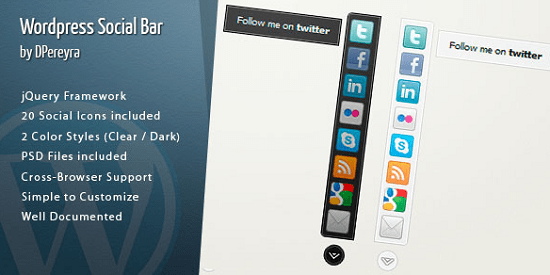 This plugin adds professional and elegant looking social icons as the floating sidebar of your WordPress site. This plugin lets you load your entire WordPress site inside your Facebook fanpage giving your visitors a chance to browse, comment and do almost everything on your WordPress site without even leaving Facebook. I hope these plugins are enough to satisfy all your needs related to social sharing and bookmarking and will help you to harness the true social networking traffic. In the next part of the series, we will continue with some amazing analytics and backup plugins for WordPress. This entry was posted in WordPress and tagged Social Bookmarking, Social Sharing, wordpress, Wordpress Plugins on May 22, 2014 by Aritra Roy.